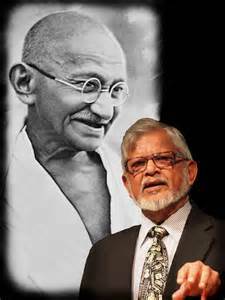 World Leader for Peace Dr. Arun Gandhi on His Latest Book: Grandfather Gandhi! This show was broadcast on April 13, 2015. We are very honored to have on the show Gandhi’s grandson, peace and social justice activist, author, journalist – an international voice for nonviolence in today’s post 9/11 world – Dr. Arun Gandhi! This entry was posted on Sunday, April 12th, 2015 at 8:15 pm	and is filed under 9/11, Anti-War, Censorship-Propaganda, Freedom, Justice, News, Protest, Quantum. You can follow any responses to this entry through the RSS 2.0 feed.